A God Man Digimon which belongs to the Olympos XII and has the appearance of a woman. It is the matured form of Minervamon that has amassed experience and achievements over time, and its personality has calmed down considerably to become more mature as compared to its time as Minervamon. Becoming Mervamon has caused it to pursue elegance and sensuality, and as its behavior, speech, and conduct are all overflowing with elegance, projecting a sensual atmosphere in its surroundings. It seeks sensuality even in battle, where it displays its refined, elegant dance moves to mesmerize observers. As such, there appear to be a great number of Digimon that became fans of Mervamon from witnessing its dance. Not only can it perform a power-filled, forward rolling slash with its greatsword "Olympia Kai" (Final Strike Roll), its "Night Stalker", in which it extends the "Medullia" on its left arm and swallows the opponent whole, will pursue the opponent anywhere, and the toxic mist sprayed from the Medullia's mouth (Love Poison) causes any enemy that inhales it to have their life squeezed out of them by Mervamon's glamor. 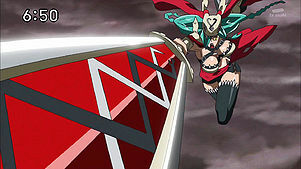 Its "Madness Merry-go-round DX", in which it turns into a tornado by performing a spinning slash which is too quick to be seen, using the "Olympia Kai" and "Medullia", instantly tears limb from limb any opponent that comes into contact with it. 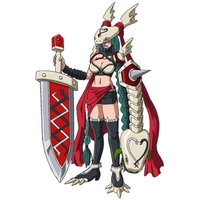 A God Man Digimon which has the appearance of a woman. As its behavior, speech, and conduct are wholly overflowing with elegance, it brings about the sensuality in its surroundings. 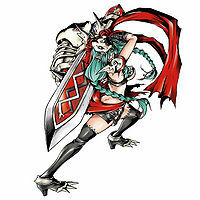 It displays its refined, elegant dance in battle, and there are many Digimon that became fans of Mervamon. 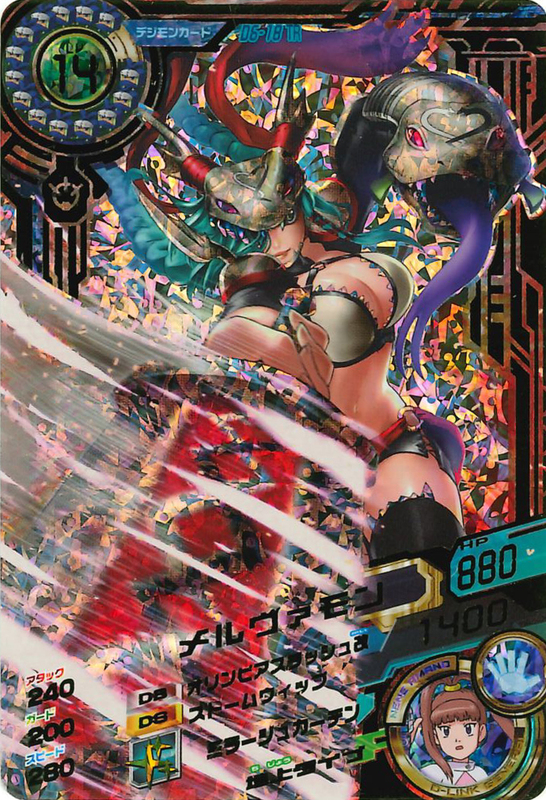 It pulverizes the opponent with a forward rolling slash with its greatsword "Olympia Kai" drawn and filled with power (Final Strike Roll). Title: 「美闘士」 — "Beautiful Warrior"
From Merva, an Etruscan goddess of war, art, wisdom and health who formed a basis for the Roman goddess Minerva. Anime/Manga Digimon Xros Wars: "Power is Being Sucked Up! The Hunters of Honey Land"
Performs a forward rolling slash with Olympia Kai drawn and filled with power. Extends the Medullia, which pursues the opponent anywhere to swallow them whole. 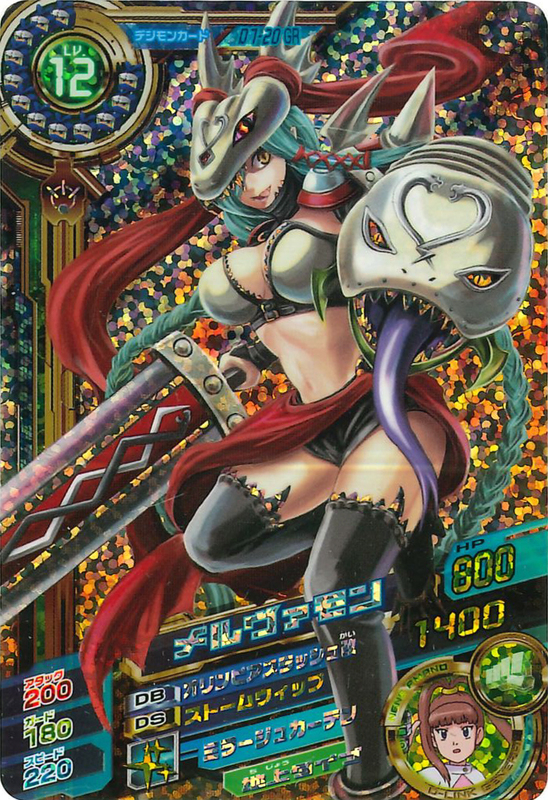 Love Poison  ラブポイズン Rabu Poizun Medullia Mist Uses its glamour to exploit the vitality of the opponents that inhale the toxic mist sprayed from the Medullia's mouth. Hebi Punch  蛇パンチ Hebi Panchi Snake Punch/Medullia Punch Strikes the opponent with the Medullia. Performs a spinning slash, too quick to catch with the eyes, with the Olympia Kai and Medullia, creating a tornado that instantly tears the opponents it touches limb from limb. 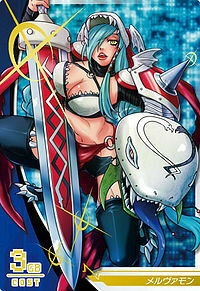 Mervamon is a Partner Digimon of Amano Nene and a member of Xros Heart. Has a crush on Beelzebumon. Cheerful Pirate, Appear! The Voyage to Gold Land!! Olegmon, the Gold-thief Laughs! Farewell, Xros Heart! Whispering to Kiriha! Earth-god General of the Canyon, A Demonic Temptation! A Mighty Love! Deckerdramon's Last Cry!! X7 of Bonds! The Grand Battle with Gravimon!! The Final Kingdom, the Shining Sun's Bright Land! Mervamon makes a cameo in the omakes of the manga. In one of them, she appears without the Medullia acting as a track coach for Beelzebumon and some Troopmon. In another one, she makes a DigiXros with Hannahmon, a Digimon based on Hannah Weber. Evolves from Lilimon by Card Evolution. Mervamon is only obtainable as a collectible DigiCard. Mervamon is available as a Digimon Medal. Mervamon can be obtained through the second update of the downloadable Code Crown. Time and experience changes everything!? A graceful and elegant greatsword user! Minervamon grew into this form over time as it amassed experience and achievements. It sports a very calm, mature personality. A Digimon that aims to achieve elegance and glamour with its every move. 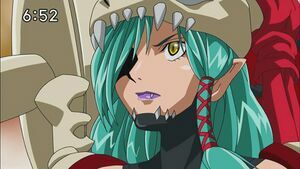 There have also been many Digimon that became fans of Mervamon at first sight. 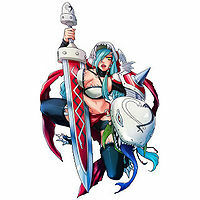 A swordswoman that continues to oppose Zamielmon's rule in Honey Land. It possesses immense strength that allows it to wield its greatsword with ease. A Digimon overflowing with fighting spirit. While its overbearing personality does invite backlash, it also possesses a kind heart. Minervamon matured over time as it amassed achievements and experience, attaining a more adult-like elegance and appeal in the process. It charms those around it with its refined and graceful movements, even in battle. Mervamon is a boss Digimon in the arcade game's fifth season. ↑ Digimon Xros Wars: "Our Power is Being Drained! The Hunters of Honey Land"
↑ Super Digica Taisen: "Fifth Act in motion report! EX Challenger Mervamon invades!" This page was last modified on 20 November 2018, at 17:25.